The changes I made were mostly out of laziness or lack of ingredients but I wouldn't change anything because this was so good! 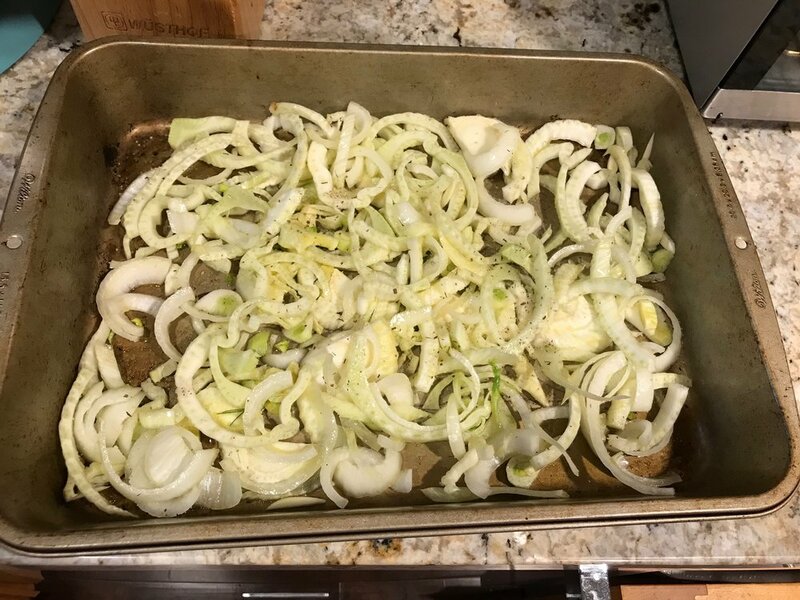 Place fennel, onions and garlic in deep cookie sheet or roasting pan. Drizzle somewhere between 1/4 and 1/3 cup olive oil on vegetable mixture and season with salt and pepper. Mix well until vegetables are coated. Roast in oven for 10 minutes. Meanwhile, sprinkle chicken breasts with seasoning salt or salt and pepper on both sides. Heat 2 tbsp oil or enough to generously coat frying pan on medium high heat. Sear chicken breasts for 2 minutes on each side until golden color appears (chicken will not be cooked through and that's OK). After the vegetables have been roasting for 10 minutes, take the pan out of the oven, stir vegetables and place the chicken on top of the mixture. Spoon some of the excess oil over the top of the chicken. Roast for 15 minutes and baste again with the oil from the bottom of the pan. Roast an additional 15 minutes until chicken is cooked through. Squeeze lemon juice over chicken and garnish with fennel fronds and a lemon wedge. We have a lot of friends right now who are new parents or expecting and I always struggle to think of a thoughtful gift to take when the new baby arrives. I think you can't go wrong with food dropped on the doorstep. Katherine tipped me off to these granola bars from Smitten Kitchen a while back, and it has been my go-to for new parents ever since. They are delicious and can be a great snack or breakfast, they are relatively healthy and there are infinite variations depending on personal taste and what you have on hand. Preheat oven to 350 and prepare an 8" x 8" glass pan with parchment paper so it hangs off the sides (makes it easy to pop out after cooking!). Spray pan with non-stick spray. Mix together both oats, sugar, salt, nuts, fruit, coconut and flax meal in a large bowl. Note that you can use varying proportions of the fruit/nut/coconut concoction depending on your taste (e.g. leave out all the fruit, add chocolate chips, etc.). In a small bowl, combine the rest of the ingredients and then combine with the dry ingredients. Spread the mixture into prepared pan (it comes up almost all the way to the top of the pan - don't worry!). Cook for 30 minutes or until they are golden on top and around the edges. Let cool and then cut into squares. Taste one just to make sure they are good before delivering to friends -- it is the right thing to do! Hello faithful readers! I thought I'd end my recent hiatus here with a cocktail post that has a couple of good holiday gift ideas as well. As the weather has turned colder this fall, brown spirits like bourbon and rye seem even more appealing than they do during the summer months. We have been branching out to try some different varieties, and as a result of our experiments I have a new favorite whiskey: High West's Double Rye. Josh and I decided to try it after reading this article, which described it as "sweet and spicy . . . [with] dry woody notes." I love the combination of spice and herbal flavors, and I even love drinking it on the rocks, which is unusual for me. At $35 for a 750 mL bottle it's not cheap, but it would make a very nice gift for someone who enjoys whiskey. And the bottle itself is very cool, making it easy to throw a ribbon around the neck and call it good. While I enjoy Double Rye on its own, I love it in an old fashioned. My method of making it involves Angostura bitters, light brown sugar, and an Amarena cherry. These cherries are a delicious addition to most cocktails--I prefer them to Luxardo cherries and they come in a very attractive crock. If you want to give a really nice gift, you could include the rye, bitters, and cherries as pictured above. But the cherries by themselves would be a fabulous gift for anyone who is enthusiastic about cocktails or cherries--they are also delicious over ice cream. And here's my recipe for a Double Rye old fashioned, which is perfect for drinking while you decorate your Christmas tree! In an old fashioned glass, start with the brown sugar and add the bitters. Then add the whiskey and the cherry and stir until the sugar is mostly dissolved. Add ice and enjoy! Look at the title. What's not to like?! This would make a great appetizer for Thanksgiving or a holiday party. Puff pastry has always intimidated me but this was actually really easy and the final product looks pretty impressive. This is adapted from an Ina Garten recipe - she used soppressata and all gruyere whereas I made it with prosciutto and half mozzarella since gruyere can be a little overwhelming for my taste. You could really do any meat and cheese combination here and I think it would be hard to go wrong. Preheat oven to 450 degrees. Cover a baking sheet with parchment paper. Take one sheet of the defrosted puff pastry and roll it out on a floured surface (put some flour on the rolling pin too!) so it is about a 10 inch square. Don't worry if it isn't perfect - you will trim the edges later. Place it on the parchment paper-lined sheet. Brush the pastry with the mustard, leaving a half inch border bare. Lay the prosciutto on top of the mustard. Brush the border with melted butter or the beaten egg and a little water (I used butter because I was out of eggs, Ina recommends egg). Sprinkle with both cheeses. Roll out the other sheet of puff pastry and lay it directly on top of the cheese covered one. Brush the top of that one with the rest of the butter or egg wash.
Chill in the refrigerator for 15 minutes or the freezer for 5 minutes so the pastry is firm. Trim the edges so they are straight and cut three slits across the top of the pastry so that the steam can escape. Bake for 20-25 minutes until golden brown. Let it cool slightly before cutting into squares. Serve warm. I know you have all been checking the blog eagerly every day for the last three plus months hoping there would be something new, and I am sorry we've kept you waiting so long! Katherine had a baby, I got married, and Elissa continues to be a super star mom, lawyer, etc. But we will be better! After spending the last month or so indulging at every possible occasion, I wanted to make something healthy to snack on and take for lunch this week. I added some grilled chicken to this recipe to make it a bit more substantial but it would be good on its own too! I also like that it can be served hot or cold, which is especially nice given our current heat wave. Pack em in there - they will get smaller!! Preheat a grill on medium high heat. Season chicken breasts with salt and pepper and brush with olive oil. Grill on each side for about 5 minutes until cooked through. Set aside. Using a spiralizer (I have this one and it works great) make zucchini noodles. Heat olive oil over medium heat and cook noodles for 3-4 minutes. You will notice the zucchini releases a lot of water as it cooks and you definitely want to drain them before adding them to the dressing! In a microwave safe bowl, heat the peanut butter for about 20 seconds so it combines well with the rest of the dressing ingredients. Add the rest of the ingredients to the peanut butter and whisk to combine. Slice the chicken into bite sized pieces and add to the noodles in a large bowl. Pour dressing over and combine well. Top with sesame seeds. You can eat it right away or refrigerate and eat it cold. It is once again my favorite time of the year at the market: stone fruit and berry season! Even though it's still early, I went a little overboard at the store last week because I was so excited to see these old favorites back again, and I came home with cherries, nectarines, blueberries, and pluots. I have been enjoying snacking on them on their own, but this weekend I got a bit of a baking bug. I remembered a recipe for blueberry buckle that I hadn't made in a long time and decided to revisit it. Have you ever had a buckle? It comes from the same family as fruit crisps and cobblers, but it is a simple cake with fruit and a streusel topping. I was first introduced to it years ago, when my sisters and I were visiting our friends the Berkeleys at their vacation home in the Poconos. We picked bucketfuls of wild blueberries that weekend and made a buckle with them. I managed to write down the ingredient list for the recipe we used back then, and a baking temperature and time, but in recreating it, I had to guess at the rest of the instructions. Nonetheless, the buckle turned out delicious. The original recipe called solely for blueberries (2 pints), and I didn't have enough so I decided to supplement with nectarines. Also the original recipe listed a bake time of 40 minutes, and mine took much longer than that (and my square pan was full to the brim) - I think you could bake this in a larger pan to reduce the baking time. Preheat the oven to 350. Grease a square baking dish (I used an 8x8 glass one). Make the cake batter: using an electric mixer, cream together the butter and sugar, then add the eggs. In a separate bowl, sift (or whisk) together the flour, baking powder, and salt. With the mixer on low, add the flour mixture in three additions, alternating with the milk. Once combined, fold in the blueberries and nectarines by hand. Pour the batter into the baking dish. Next, make the streusel. In a bowl (pro tip: use the same bowl you used for mixing the flour to cut down on dishes), combine the sugar, flour, and cinnamon. Cut the cold butter into the mixture using a pastry blender, two knives, or your fingers. You want the mixture to look like small pebbles. Sprinkle the streusel over the cake batter. Bake the buckle for approximately 1 hour, until a cake tester comes out clean. Serve warm or at room temperature, with some ice cream on the side if you're so inclined! Shishito peppers are having a moment right now. They're on almost every sushi restaurant menu as an appetizer and are popping up outside of Japanese cuisine as well. They are best when kept very simple in my opinion (hold the bonito flakes please!). About one in every ten peppers is spicy, making the experience kind of a fun game of Russian roulette (yes, I am old...this is how I get my kicks these days). And an added bonus is that they are extremely easy to prepare at home. Preheat a grill on high (can also use a frying pan over high heat). Toss peppers with olive oil and garlic salt. Place peppers directly on grill and turn every 2 minutes until they are blistered and black in parts (about 6 minutes). Remove from heat and finish with flaky sea salt to taste. My toast addiction is well known, and part of the beauty of this wondrous dish are the infinite variations it allows. I am back on the Farm Fresh To You train and had some maitake mushrooms and green chard I needed to use. I've also been craving a ricotta toast dish I've had a few times now at Scopa Italian Roots in Venice (if you are in the area, please go immediately and order this). The combination worked out really well and was very easy. If you're entertaining, it would make a great topping on sliced toasted baguette. Ingredients plus new Wustoff knife that makes everything better! Heat 2 tbsp olive oil over medium heat. Add garlic and mushrooms and cook for about 5 minutes. Add chard and salt and pepper and red pepper flakes. Cook until chard is wilted - about another 5 minutes. (If you haven't already, now is a good time to throw bread in the toaster.) While chard cooks drizzle remaining 1 tbsp over ricotta and season with salt and pepper. Mix well. Spoon ricotta mixture over toast and top with mushroom and chard combination. Sprinkle with sea salt flakes. Greetings from the land of perpetual winter! While we have sighted a few harbingers of early spring, it has been an exceedingly cold March on the east coast, and it feels like warmer weather will never arrive. Lane's first little league game took place yesterday with sub-40 degree temperatures and a biting wind. Josh and I have taken refuge from the cold in a drink that suggests the tropics. Although the name daiquiri might conjure images of a sweet, slushy drink, this version is not all that sweet, and it uses fresh citrus juice that is still in season. The only ingredient that is a little unusual is Luxardo maraschino liqueur, but most well-stocked liquor stores will carry it. And once you invest in a bottle, you are well-positioned to make your own maraschino cherries once sour cherries are in season. The fresh lime juice has a nice bite, which is softened a little by the grapefruit juice and the maraschino liqueur. It it refreshing and tropical-tasting at the same time. And it's a beautiful pale-pink color (thanks to the grapefruit). So if you are as depressed about the recent cold weather as I am, or even if you're not, I'd recommend mixing up a Hemingway daiquiri tonight! Pour liquid ingredients into shaker filled with ice. Shake vigorously and strain into a cocktail glass. Garnish with cherry and dream about warmer temperatures. This was a dinner that I was not intending to blog about, but after I took my first bite, it was so delicious, that I had to take a quick photo and share it with you. I have tried cooking with spaghetti squash in the past, but I was never wowed by it - I still found myself missing the delicious carb-fest of real pasta. But the sauce on this recipe is so flavorful (the buttery goodness doesn't hurt) that I found myself not missing a thing! I used frozen shrimp (thawed) from Trader Joe's, and it turned out great. Preheat oven to 400 degrees. Cut spaghetti squash in half, lengthwise, and scoop out and discard seeds and stringy bits. Place the squash halves face down in a roasting pan, add 1/2 cup water, and cover with foil. Roast for 45 minutes, until squash is tender when pierced with a fork. While squash is roasting, prepare the other ingredients. Begin cooking when the squash has about 10 minutes left. Season the shrimp with salt and pepper. Heat the olive oil over moderate heat and cook the shrimp until browned on each side, about 3 minutes total. Remove the shrimp to a plate. Add the garlic to the pan and let cook very briefly (about 15 seconds), then add wine, lemon juice, and tomatoes. Boil, stirring occasionally (make sure you get all the browned bits from the shrimp), until the liquid is reduced by two-thirds. Reduce the heat to low, and add butter and basil, then return the shrimp to the pan. Season with salt and pepper. Using a fork, scrape the squash flesh away from the skin, creating "spaghetti" strands. Serve the shrimp and sauce over the spaghetti squash. *SEE?? IT IS VERY ORDERLY! No matter how obsolete print media has become, there is still something really nice for me about getting a magazine in the mail. Bon Appetit is one I still subscribe to, and I thoroughly enjoy curling up on a lazy Sunday with it and carefully* tearing out pages that have recipes I want to try. Most of them then sit collecting dust in a basket on our kitchen counter. John very kindly does not comment on this messy pile of paper that inevitably accumulates. And that might be because every once in a while I dust it off and it becomes a surprisingly good dinner. 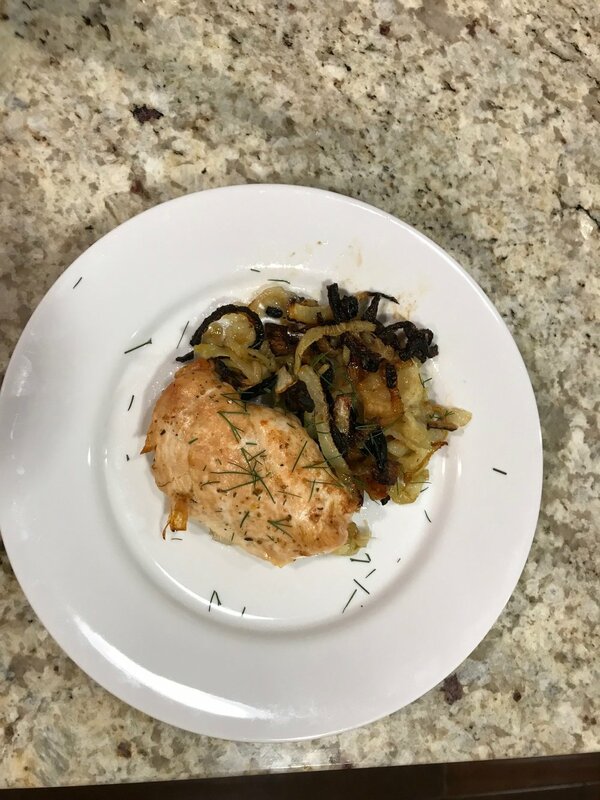 This is where the inspiration came from for these pork chops that I served over whole wheat pasta with shallots, capers, garlic and breadcrumbs (also a BA recipe worth trying - what's not to like?!). I used boneless pork chops because they were on special at Von's and it seemed easier, but Bon Appetit recommends bone in. Heat the oil in a cast iron or heavy skillet on medium high heat. Season the pork chops on both sides with kosher salt and freshly ground pepper. Drop the chops in the hot pan and cook for about one minute, then flip and cook for another minute. Keep flipping and browning until the chops are cooked through (about 8 minutes total depending on the thickness of the meat). Take the pan off the heat and add butter, garlic and sage mixing these ingredients and then spooning them over the chops. Please do not waste the butter/sage/garlic sauce and sop up any leftovers with bread or serve over pasta as I did. Served with roasted carrots and pasta with breadcrumbs, capers, garlic and shallots. Last weekend, Josh and I were lucky enough to travel to New York for three whole nights by ourselves. We ate and drank very well while we were there, so I thought I'd share some of the highlights. Best pasta: the ricotta gnocchi at Lupa. I first had them with Katherine back when she was living in New York, and this was one of those rare dishes that lived up to my memory! Best cocktail: the custom cocktails that we ordered at Lantern's Keep, the bar at the Iroquois Hotel near Times Square. Basically you give the bartender a liquor or a theme to work with, and they will design a drink to suit your tastes. Mine involved London dry gin, lemon juice, orgeat, and absinthe. I'm going to try and re-create it at home, but will have to mix up a batch of orgeat (almond syrup) first. Runner up: The Guthrie Inn on the Upper East Side, a funky speakeasy-type place. Best overall dish: the vanilla doughnuts we had during brunch at Perilla in the West Village. The doughnuts were served hot from the fryer with a somewhat tart apple butter, which was a brilliant flavor combination. Best food souvenir we brought back to DC: tie between a box of Kee's chocolates and a hunk of gruyere we bought at Murray's. We had an amazing weekend despite the frigid temperatures. Thanks again to Donna and Joanna for taking such good care of the kids while we were away! You get a pretty big bowl from 5 small zucchini but beware, they shrink when you cook and it is less filling than pasta! If you haven't heard of zoodles, they are noodles made from zucchini spun through a spiralizer, the newest gadget addition to my kitchen. I bought the Premium Vegetable Spiralizer off of Amazon for $15 and can't believe how easy it is. You just rinse the zucchini (I think yellow squash or even carrots could work well too) and spin it while putting a little pressure on it and you get long, thin noodles. You can top with any sauce and I have tried a few, but find that a saucy but hearty sauce like bolognese makes it easier to forget you're eating vegetables instead of pasta. Ina Garten's weeknight bolognese works well. You can also mix it up so it is half noodles and half zoodles if you're nervous about going full zoodle. Half zucchini noodles, half linguini with Ina Garten's Bolognese. I have written before about my quest for the perfect healthy muffin. While I love the morning glory muffins from my earlier post, they are a bit of a project. The other day I wanted to see if I could come up with a not-too-decadent option using ingredients that are easier to prepare. I adapted this recipe for oatmeal applesauce bread from King Arthur Flour and was pretty delighted with the results. They are excellent with cream cheese. I always freeze the leftover muffins; after 20-30 seconds in the microwave they make for a quick and delicious weekday breakfast. 1 apple, peeled, cored and grated. Preheat oven to 350 and grease a muffin tin or put paper muffin liners in the wells. In a large bowl, mix together the sugar, eggs, oil and vanilla. In a separate bowl, mix together the flours, baking powder and soda, and spices, and add them to the wet ingredients in the bowl. Mix in the oat flakes, applesauce, and grated apple. Scoop into muffin tin and bake for 16-18 minutes. One of the things I miss most about living in California (besides my family and the weather, of course) is good Mexican food. Most of the Mexican food in DC just can't compare. 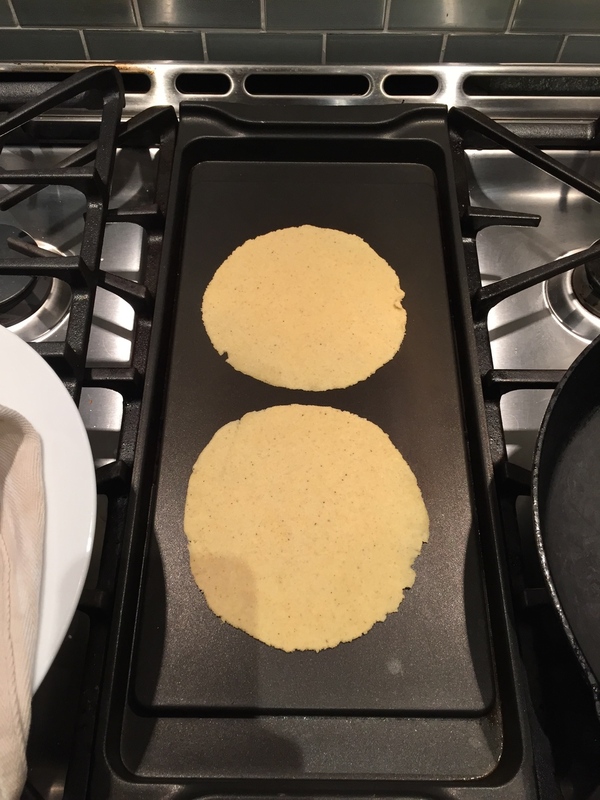 I had read about making corn tortillas from scratch, and last weekend I decided that we were going to attempt the project. The only ingredients are masa harina (a special kind of corn flour) and water. A tortilla press isn't strictly necessary, but after doing some reading I decided that we'd have a much better final product if I acquired a press. I found the masa harina at Whole Foods and the tortilla press at Sur la Table, and we were ready to get started. I combined the masa harina with hot water according to the directions on the package and let the dough sit for an hour. 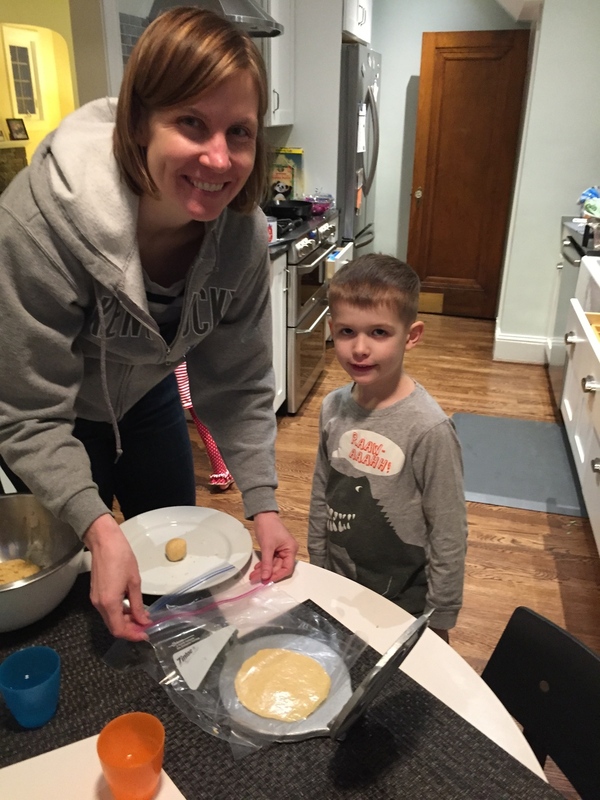 Then it was time to get our tortilla assembly line going--fortunately Lane agreed to be my helper. We rolled the dough into plum-sized balls, pressed them in the tortilla press, and cooked them quickly on the griddle. Lane also worked on the guacamole--thank goodness for child labor! The raw tortillas were very fragile--it was easy to tear the edges when extracting them from the press. I used Kenji Lopez-Alt's trick of lining the press with a cut open Ziploc bag, which worked pretty well. I was amazed at how quickly they cooked--just a minute or two per side, which made it hard to multi-task while making them. But the tortillas stayed warm wrapped in a dish towel for a little while. I decided to use our tortilla masterpieces in this fish taco recipe from Sam Sifton of the New York times--even though it was freezing last weekend I was determined to enjoy a dinner that reminded me of sunshine and the beach. The kids refused to eat any fish or cabbage, but they were enthusiastic about the fresh tortillas with guacamole and shredded cheese. While these weren't the best tortillas I've ever eaten, they were a huge step up from store-bought corn tortillas. And Josh and I thought that the fish tacos were terrific. Now we just need to plan a family vacation to Baja to compare our handiwork to the real thing! We can all agree that the main reason brussels sprouts have surged in popularity is that we figured out that if you fry them or add bacon they taste way better. Steamed brussels sprouts are the worst. And I never would have thought I'd like them raw but this salad has become one of my favorites that is in my regular rotation. As with most salads, improvisation is encouraged based on what you have in the fridge and personal preference. Adapted from Food52. Soak the red onion in cold water for about 15 minutes or however long it takes you to assemble everything else. Juice your lemon (you may need 2 depending on size and juiciness) into a jar or bowl. Add honey and mustard in same bowl. Whisk in the olive oil and season with salt and pepper. Combine brussels sprouts, almonds (any nut will do! ), avocado, red onion and the pecorino. Shake up or whisk the dressing one more time before drizzling over the salad and serve immediately. Seabass is my favorite fish, and SURPRISE, it is also super expensive, so I will start by saying you can use any budget-friendly mild fish (e.g. tilapia). Some reviewers of the original recipe even said they tried it with good results on chicken, which I may try next. If you need to make a meal for a special occasion though, I recommend splurging on the seabass. The recipe below is for just two, so make adjustments as necessary. Preheat the oven to 350 and place your baking dish with the pad of butter in the oven to melt the butter. Cut the bread into small pieces. I cut the bread into about 6 narrow rows and then again in the opposite direction to make small crumb-size pieces. (The original recipe has you do this with a food processor but this took just a couple minutes and no food processor to wash!). Heat the remaining butter plus the smashed garlic cloves in a small sauce pan over medium-low heat. Once it starts bubbling a little bit remove it from the heat. By now the butter should be melted in the baking dish. Remove it from the oven and place your fish filets in the dish. Season with salt and pepper. Zest the lemon over the fish and sprinkle thyme over that, followed by a healthy squeeze of lemon juice. Bake fish with breadcrumbs in the oven for 12-15 minutes. So good!! Final product served with baked sweet potato disks and sautéed spinach and kale.